It’s been so nice to follow along different friends’ vegetable gardens on Facebook. 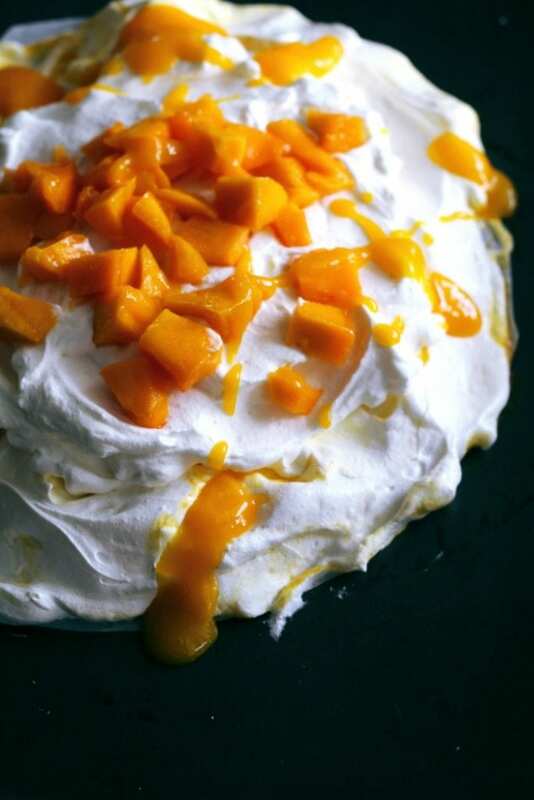 I have my gorgeous mango tree and recently made this Mango-Ripple Meringue. That is not the only thing we have been making with our mangoes. I think you may know that mango smoothies is the drink of the day, sometimes even three times a day. We have been giving away bags of mangoes to neighbors and friends. We have canned the mangoes and we have frozen the mangoes. The mangoes get added to salads and they get added to yogurt. There is no end to how we eat the mangoes. The only aggravating part of the mangoes is the enormous amount of peeling that needs to be done when you are cleaning and cutting a huge batch. But it so totally worth it because we are blessed with wonderful mangoes that aren’t stringy at all! I tried to get a good shot of the mango swirl that was going on. The color is pretty light so it was hard to show up with the white meringue, but it is very delicate and pretty!!! And when I say delicate, I mean delicate! Once it’s baked, don’t mess around with it trying to move it. It is so easy to crack and break into a million pieces!! Now if you have a hard time coming across mangoes, you could make this even with strawberries or even peaches. Meringues are so easy to make but keep in mind that they are super delicate! When it is time to serve it, it cracks into many pieces. Just grab your fork and gather around! You may be dealing with a minor argument to get a portion, because this lovely meringue goes pretty quickly…it’s just fabulous!! Thanks for stopping by and hope you had a great rest of your summer! I’ll be back next week with more end of summer recipes!!! 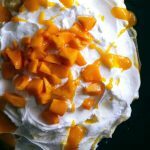 A light and fluffy summer mango swirl meringue topped with whipped cream and a fresh mango sauce. Preheat oven to 200 F. Let egg whites stand at room temperature for 30 minutes. Line a baking sheet with parchment paper. Draw a 10-inch circle on the paper. Flip the paper over so circle is on the other side on the pan. For the meringue: In the bowl of a stand mixer fitted with a whisk, beat egg whites on medium speed until soft peaks form. Add the sugar mixture 1 Tablespoon at a time; continue beating on high speed until very stiff and glossy peaks form, about 5 more minutes. Beat in the vinegar and 1/2 teaspoon of the vanilla. 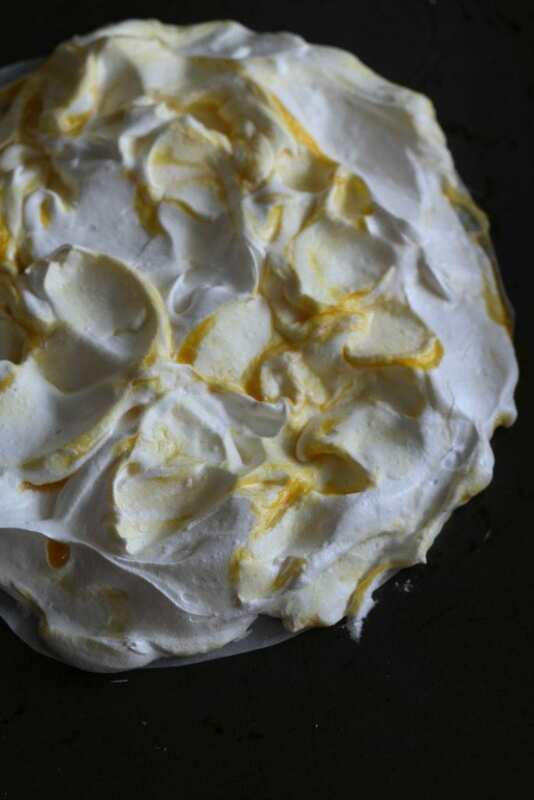 Using a rubber spatula, spread the meringue over the circle. Shape it into a 9″ disk by making the meringue conform to the circular outline; smooth top and sides with rubber spatula. Turn off the oven and let the meringue dry in the oven with the door closed for 30 minutes. Remove from the oven and let it cool completely (about 3-4 hours). In a medium bowl, beat the whipped cream until stiff peaks form. 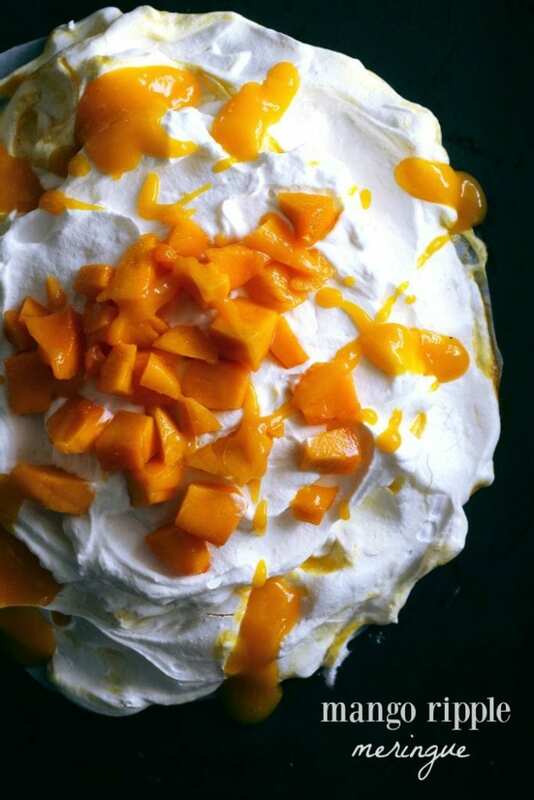 Pour the whipped cream mixture onto the cooled meringue and spread evenly over meringue’s top using a rubber spatula. Decorate with mangoes and mango sauce. Oh, how I wish that my climate could support mango trees…or that I could at least take some off your hands. 😉 This is gorgeous, I adore meringues and pavlovas! We grew up with a mango tree in the yard and HATED it! There was always "garbage"in the yard, but now, without the tree, I can't get enough of mangoes. This meringue looks amazing! You have a mango tree?! So jealous!! This looks wonderful! Oh, boy, to have that supply of glorious mangoes!! Your meringue is gorgeous!! Wait! You have a mango tree in your yard?? Totally jealous! 🙂 And this dessert is just gorgeous! How lucky you are to have a mango tree! What a lovely, lovely dessert — meringues are always so pretty, and this with the fruit is so nice! This looks amazing! I love mangoes and this is a great new way to enjoy my favorite! I'm so envious of your abundance of mangoes! I've never attempted merignue but you've made it sound easy enough! I would be eating mango's all day long! This looks amazing! A mango tree? That's wonderful, and this is just gorgeous!